Here we are! 2012! As we close one year and begin another, it’s time to reflect on the goals I made last year at this time. I made 6 resolutions last year. I thought by posting them, it would always remind me to stay on track. 1) Count every single gelato I eat. This was on that was really easy to do. Often times, I would forget and Carlo would have to remind me. I try to write my daily activities in my Moleskine Agenda which made it much easier to track the days that I may have had a gelato while grocery shopping. The total count for 2011 was 75. It seems quite low to me. After all, I was in the States for 5 weeks during the summer which the height of my gelato consumption. AND….. I’ve been off gelato with this pregnancy. With Valentina, I had to have one.. or 2 a day and with this baby, I don’t have much of a desire for it at all. 2) Send out Birthday/Anniversary cards. 3) Increase my Italian to Advance level. Yeah.. this one didn’t go over so well. I didn’t study at all but my comprehension did improve a bit. I can now listen to Carlo’s political TV shows and understand somethings but not everything. Sadly, I would not consider my lever to be Advance at all. Maybe Upper- Intermediate. This one… was not a good one for me. I am the least organized person. I have everything in a pile on my desk or in a box under my desk. The only thing that is organized is the mess. I started off really good on this one and tried to even post what I had made. Sadly, this one fizzled out pretty quickly and by quick I mean, February. I think we all know how this one turned out. However, I am not the only one. I noticed a drop in blogging in a lot of my friends blogs so that just means 2011 was super busy and we couldn’t keep up. Now that we’re 11 hours into 2012, I’m trying to figure out what I want to accomplish this year. Shall I retry my 2011 goals or make new ones. I think maybe to a bit of both. Carlo got me into reading and I thank him for it but sadly, 2011 wasn’t a big year for reading. The last few months I started doing Sudoku puzzles again to get my brain to concentrate and thinking again. So I feel ready to enjoy reading again. 2) Get organized: for real this time! I have to get serious on this one. We’ve got baby #2 on the way and we don’t have any room for anything. Carlo and I have decided to de-clutter and minimize the stuff we have down to essentials only. Meaning, Valentina will be doing without a lot of her toys and all of our “extra” dishes and such will be boxed up to make more room for our expanding family. 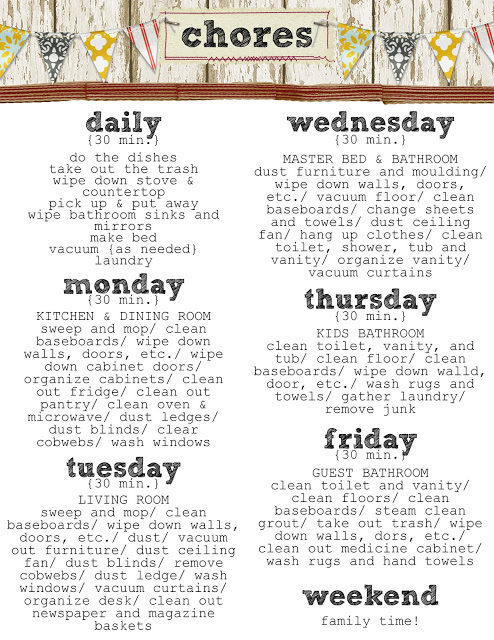 Keeping the house clean also falls into this category so, as soon as Carlo goes back to work, I’m going to have him print out the list below to try and keep this house in order. Look familiar? I got it from Pinterest. I’m going to try this for a few weeks and then make my own list since our home is only 2 bedrooms, 1 bath and a kitchen/living room/dining room all in one. 3) Get crafty with Pinterest! I love Pinterest! It’s the best addiction since Facebook and might I say, it’s way better. There are so many cute things I’d like to make but I haven’t been too motivated. However with Elisabetta Kate coming, my creative juices have been flowing. I made a Christmas wreath for our door and a Baby wreath for when EK is born. I’ve also made some of the recipes from my food board. 2 years ago, I learned how to knit but haven’t done anything more than a scarf. So, I’d like to expand and try to knit/crochet some of the cute things I see on Pinterest as well as try more recipes. If you’re on Pinterest, check out my boards. This blog is about my life yet, I’m only documenting things that pertain to Valentina. I really need to blog about the things I like, don’t like, pet peeves, etc… So I’m gonna be a bit selfish this year. (in a good way) I resolve to finally make time for myself. I do realize that this might be a bit difficult since EK will make her debut in February but I have to at least try. Most of my goals this year are pretty much stuff I WANT to do for myself. I want to make more time for me to enjoying reading, blogging, learning about photography, cooking and baking, etc.. I want to finally have time to sit at my organized, clean desk and work on my pictures, edit, blog and make things. I want to actually wear make up again and NOT look I just threw things on. I will spend my money on ME. I will NOT spend Christmas money given to me on groceries. I will spend it on something I WANT. Maybe a book about photography, camera bag, yarn and knitting needles. Here’s to 2012! If I fall off the “resolution wagon”, I will immediately get back on.